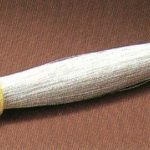 This article will go into the details of each drying method. All applications benefit greatly by the installation of air receiver tanks. It is generally accepted that no receiver is too large for an application and no number of receivers are too many, and the installation of a vertical or horizontal receiver tank usually depends on physical space available. The receiver serves many important functions. 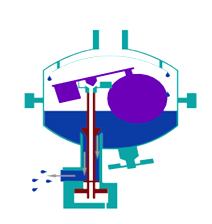 It damps pulsations from the discharge line of a reciprocating compressor, resulting in essentially steady pressure in the system. It serves as a reservoir to take care of sudden or unusually heavy demands in excess of the compressor capacity. 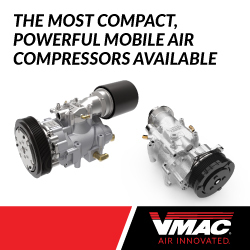 It prevents too frequent cycling of the compressor. In addition, it serves to precipitate some of the moisture that may be present in the air as it comes from the compressor or that may be carried over from the after-cooler. 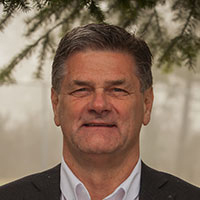 The minimum receiver capacity for certain applications may be calculated, but experience and judgment are just as important. Receivers are also used to meet heavy, short time demands of certain equipment, and the manufacturers of this equipment could supply the information on the air requirements in such cases. The storage of quantities of moisture in receiver tanks leads to the formation of rust and scale on the inside of the tank, which can become loose and get carried down-stream in the outgoing air. This rust and scale can cause problems of blockage in air-using components and premature blockage of filters. The reason for large volumes of liquids in the air receiver is that the tank is made of steel, and the wall temperature of the vessel is the same as the ambient temperature. Even if the compressor is supplied with an air-cooled after-cooler, there is always a difference between the discharge air temperature of the after-cooler and the ambient air temperature (the approach temperature). As the cooling is not 100 percent efficient, the air discharging from the after-cooler will always be higher than the ambient air being used to cool the hot compressed air. This difference in temperatures is called the “approach temperature”. As soon as air leaving the after-cooler enters the receiver tank it comes in contact with the cooler steel wall of the tank, which is usually at ambient temperature. At this point, moisture starts to condense out of the compressed air as the air chills. If the air is stored in the tank for enough time, the temperature of the air in the tank will be the same as the ambient temperature, and no more moisture will condense out. At this point the air in the receiver tank is 100% saturated at a dewpoint equal to atmospheric temperature. An after-cooler is a heat exchanger used to cool compressed air. Reduction of the compressed air temperature will cause moisture and oil droplets to precipitate out of the air. These liquid contaminants are typically collected and drained off with a moisture separation device and drain trap (either mechanical or timed). The after-cooler should be located as close as possible to the compressor outlet. A heat transfer will occur between two bodies of different temperature until temperature equilibrium is reached. This transfer of heat can take place in three different ways. Generally these take place simultaneously. The air-cooled after-cooler looks very much like a car radiator, and acts like one as well. 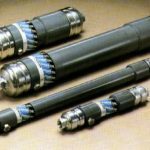 However, rather than coolant filling the interior tubes, the hot compressed air enters the bottom of the air-cooled after-cooler and travels within a tube system, discharging through the upper discharge port into a moisture separator. The tubes have fins, or metal plates between them to increase their surface area, and dissipate the heat more effectively. As heat from the compressed air transfers to the cooler atmospheric air, some of the heat of compression is removed from the compressed air and carried away. Water-cooled after-coolers effectively do the exact same thing only with much more control of the discharge air temperatures. The primary difference between air-cooled and water-cooled after-coolers is that there is a flow of liquid coolant flowing in a shell and tube or a plate-fin design heat exchanger absorbing the heat of compression from the compressed air volume. The refrigeration compressor compresses the refrigerant gas to a predetermined pressure and pumps it out towards the condensing coil. At this point, the refrigerant is a hot gas under pressure. This hot gas moves to the condensing coil where a fan moves cooling air across the coils of the condensing area (Air-cooled version). 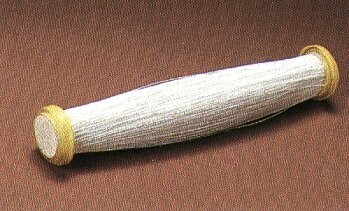 The air moving across the coils removes the heat of compression and causes the hot gas under pressure to cool, forming a room temperature liquid under pressure. The hot gas under pressure has condensed to a cooler liquid under pressure, so the area in which this takes place is called the condensing coil. The liquid refrigerant now continues on to the liquid receiver. As the compressed air flow through the dryer varies, liquid refrigerant is metered by the thermostatic control valve (TCV) to match demand. A filter, dryer and sight glass are typically in the line between the storage receiver and the TCV. The TCV reduces the temperature and pressure of the refrigerant by throttling and flashing off some of the liquid. The cold liquid and gas mixture passes next through a venturi-type refrigerant distributor to each circuit at the bottom section of the copper tubes and ensures that they are completely flooded. The copper tubes are designed to extract the greatest possible amount of heat from the compressed air. The refrigerant absorbs the heat from the compressed air and reverts back to a gas, then flows to the suction accumulator which prevents liquid carry-over from entering the inlet of the refrigerant compressor. We take this simple system and apply it to the job of drying compressed air. To do this, we will add a heat load to the refrigeration system (The heat of compression in the compressed air). What you see now is a simple dryer. If the heat load remains constant at the reheated outlet of the dryer, the refrigerant compressor will continue to run, and the refrigeration cycle will continue unbroken. What would happen if the compressed air system was operating at partial load or unloaded for some period of time? Would the heat load to the dryer become less? Yes! The heat load is less, therefore the refrigerant coming through the evaporator will not encounter enough heat to fully evaporate. The suction from the refrigeration compressor will try to pull all of the vapor from the suction side, but the liquid is not evaporating at the usual suction pressure. This new lower pressure, and the evaporation it encourages, lowers the evaporator temperature. 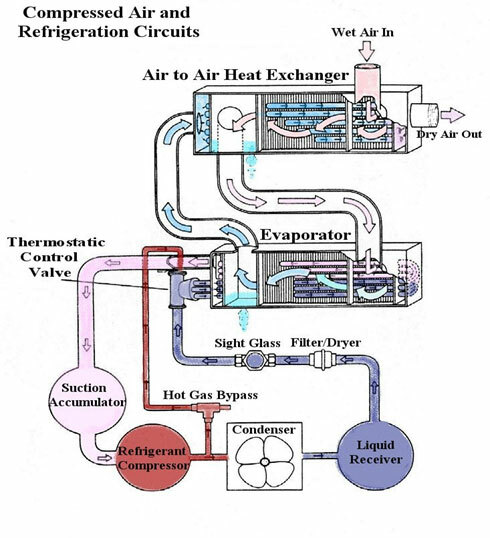 If the refrigerant compressor is not stopped, the added evaporation would cause the water in the air to freeze in the evaporator air-to-air heat exchanger. This would block the flow of air, and effectively shuts down the system. If the refrigeration compressor is shut down, as soon as the system catches up with the incoming air load, the refrigerant compressor must start again. Because the system was shut down, it will take a little while for the compressor to build pressure and condense the refrigerant. During this time, the incoming heat load will tend to get ahead of the dryer, and there will be an upward swing in the pressure dewpoint. In some cases, during the swing time, very little drying will take place. As you can see, this is not an acceptable way to control the pressure dewpoint. The hot gas bypass valve seems to be one of the more effective ways of controlling the refrigeration system to give close pressure dewpoint control. With the hot gas bypass valve installed, and with the air compressor at full load condition, the dryer would function just like the simple dryer we discussed earlier, or any typical refrigeration system. It is under a partial air compressor load situation that the bypass valve begins to function. The load changes at the evaporator, due to the compressor modulating or unloading. There is not enough heat to evaporate all of the refrigerant and the refrigeration compressor is lowering the suction pressure. As the suction pressure goes below 33 psig, and continues to go down, ice will begin to form in the heat exchanger and begin to block the flow of air. At this point the hot gas bypass valve opens, and channels very hot gas into the suction side of the system. It maintains a suction pressure high enough so that ice will not form in the heat exchanger. refrigerant through the filter / dryer so that less refrigerant will flow into the evaporator. The hot gas mixes with any liquid refrigerant in the suction side, turning it to a gas. At the same time, the injected hot gas is being cooled to an acceptable level to be drawn into the inlet of the refrigeration compressor. Now there is an immediate demand for more dry air. The compressor goes into full load mode, and the full capacity of the compressor rushes through the dryer to be cooled down. The suction pressure immediately rises to above 34 Psig and the hot gas bypass valve closes. This, once again, puts the full pressure of the hot gas against the liquid coming through the filter / dryer, giving an immediate supply to the evaporator and stabilizing the pressure dewpoint in seconds. This is an example of one of the methods used to control a refrigeration type air dryer. In-coming hot compressed air enters the air-to-air heat exchanger and flows down the inner tube of a tube-in-tube bundle. The incoming hot air is being pre-chilled by the air travelling in the outer tube, which has been cooled by the refrigeration section. As the air cools, water vapor condenses into liquid droplets. The condensed liquid droplets are then removed from the air stream in the separator and automatically discharged to drain by an automatic condensate drain trap. This pre-chilling is done to allow for the use of a smaller refrigeration unit, and increase the efficiency of the dryer package. The pre-cooled compressed air then enters the air-to-refrigerant heat exchanger, where the heat is removed directly from the compressed air by the refrigeration system down to +35o F.
As the air continues to cool, water vapor again condenses into liquid droplets. The condensed liquid droplets are then removed from the air stream in another separator and automatically discharged to drain by an automatic condensate drain trap. Finally, the air passes through the secondary side of the air-to-air heat exchange, where it is re-heated by the incoming hot air. The re-heating the outgoing air is to prevent downstream pipe sweating, and increasing the effective volume of the air, enabling it to do more work. It also will take longer for a pipe exposed to cool atmospheric temperatures to drop from the re-heated temperature to a point less than +35o F.
No recurring costs other than electricity. Some dryers have shown a problem with refrigerant leakage. Incoming air enters the vessel near the base and passes through the mechanical separation section. Due to expansion, the free liquids and solids drop to the bottom of the vessel. To some degree, this constitutes a pre-drying of the air. The air then enters the desiccant bed of deliquescent materials such as water-soluble salts or shotted urea. The hygroscopic chemicals condense water vapor as they deliquesce or dissolve. Absorption occurs until the tablets are completely consumed, at which time, they must be replaced. Age and Composition of the deliquescent material. The compressed air inlet temperature. Lowest initial cost of all dryer types. Dewpoint suppression is between 20o-30o F (On average). Deliquescent material must be added to or replaced as it absorbs and melts. Downtime to replace deliquescent material. Ecological problem of disposing of the dissolved deliquescent material. the air to by-pass most of the drying material. This reduces the dryers performance. Dual tower desiccant air dryers are used to produce dewpoint temperatures below the freezing point of water, as well as reduce the moisture content of compressed air used in critical process applications. Typical dewpoints produced by these types of dryers are -40 o F to -100 o F, although lower dewpoints are possible. These types of dryers are typically used to dry instrument air and process air, as well as applications where airlines are exposed to low ambient temperatures, below 32 o F, and in other critical applications. 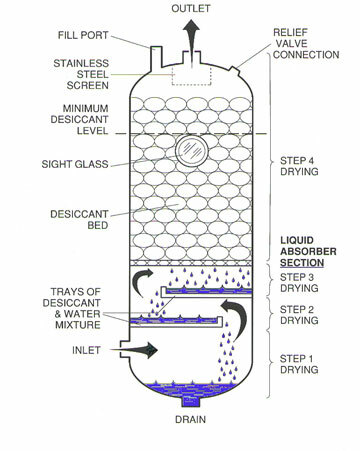 Desiccant dryers lower the dewpoint of compressed air by adsorbing water vapor onto the surface of a desiccant. 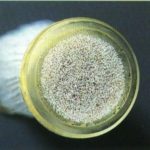 The process of adsorption begins as the water vapor, which is more highly concentrated in the compressed air stream, moves into an area of lower water vapor concentration in the pores of the desiccant. Once inside the pores, a natural attraction of the vapor molecules to the solid surface of the desiccant causes water vapor molecules to build up on the surface of the desiccant. As enough molecules gather, vapor changes phase and becomes a liquid. The process continues as long as the concentration of water vapor in the air is greater than the concentration in the desiccant pores. The water remains on the surface of the desiccant until it is stripped off. This is called reactivating or regenerating the desiccant. By doing this, the desiccant may be used again and again. 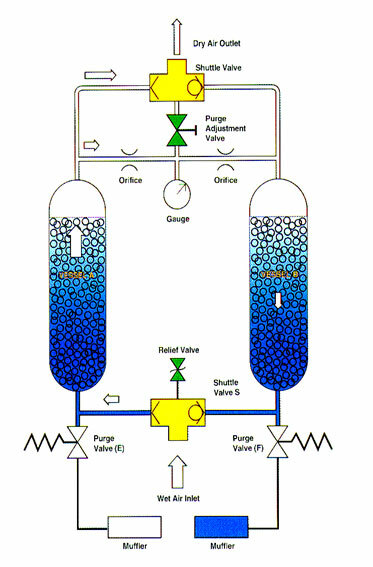 In summary, in a desiccant dryer, adsorbing the water vapor onto the large, dry surface area of a highly porous material called desiccant dries the compressed air. This adsorption occurs as water vapor in the compressed air moves into the pores of the dry desiccant and is attracted to the surface of the pores. Dual tower desiccant dryers offer a continuous supply of dry compressed air by using two identical towers each containing a bed of desiccant beads. While one tower is on stream drying the compressed air, the other tower is off stream so the desiccant in that tower can be regenerated. In a pressure swing type regenerative dryer, the regeneration of the desiccant bed is accomplished by expanding some of the dried air to near atmospheric pressure and directing it across the wet desiccant bed. This swing in pressure produces expanded air with a very low water vapor concentration. Because the water vapor concentration of this expanded or purge air is less than the water vapor concentration in the pores of the desiccant, water vapor moves from the desiccant back into the purge air stream. The purge air stream then carries the desorbed water out of the dryer. Pressure swing dryers are often called heaterless or heatless dryers because no outside heat is added for the regeneration of the desiccant. The main air stream enters tower A at the left inlet switching valve and is dried by the desiccant. The dry air is then directed by a system of check valves to the air outlet. While this occurs, the desiccant is regenerated in the off-stream tower by throttling a portion of the dried air to near atmospheric pressure by means of an adjustable purge rate valve and orifice. This expanded air, or purge air, flows through and reactivates the desiccant in tower B. The purge air is then exhausted through the right purge re-pressurization valve and muffler to the atmosphere. After 4 minutes, the right purge re-pressurization valve closes, allowing tower B to slowly re-pressurize. At 5 minutes the left inlet switching valve closes and the right inlet switching valve opens. The main air stream is directed across the regenerated desiccant in tower B. As this occurs, the left purge re-pressurization valve opens, allowing tower A to depressurize. Purge air now flows through tower A allowing the desiccant in this tower to be regenerated. The bulk of the vapor is removed in the lower part of the dryer, and the upper section is used to polish the air (to remove the final grains of moisture, to arrive at the final pressure dewpoint). All dryers of this type work essentially the same way. The flows through the dryer must be precisely controlled to prevent bed movement. If the air velocity were too great the desiccant would begin to float, or fluidize. This would cause the desiccant beads to rub together and degrade as desiccant particles wear away. This desiccant dusting reduces the useful life of the bed as well as increasing wear and tear on the valves. Dusting also causes frequent maintenance of downstream filtration. To prevent bed fluidization, manufacturers design their dryers to have the off-stream tower slowly and completely re-pressurized before tower change over. This prevents bed jolting as well, after changeover. On some dryers, the inlet air enters the bottom of the tower, and flows upward through the desiccant bed. This allows any liquid water and large contaminants present in the air stream to separate out in the bottom of the tower. The collected contaminants remain there until they are flushed from the system as the tower is depressurized. The average purge air (consumption) requirements of a heaterless type air dryer is 15 – 20 % of the rated capacity of the dryer. (Not the compressed air system delivery capacity) The purge air requirement varies with the different manufacturers’ requirements and designs. Another important aspect of adsorption, is the release of heat as water vapor is adsorbed onto the desiccant. This heat of adsorption is produced by the change in the energy state that occurs as water vapor is attracted to the desiccant and condenses. The Membrane dryer operates on the principal of selective permeation through a membrane. As the compressed air passes through a bundle of tiny hollow (polysulfone) membrane fibers, water vapor and a portion of the compressed air flow diffuses through the semi permeable membrane walls while the dried air continues downstream. The Membrane dryer must be used only with clean, oil free air. It must have a coalescing prefilter installed ahead of the dryer to remove any liquid water, oil and aerosol contaminants from the compressed air stream, as these would block the permeation’s of the fibers, reducing the performance of the dryer. 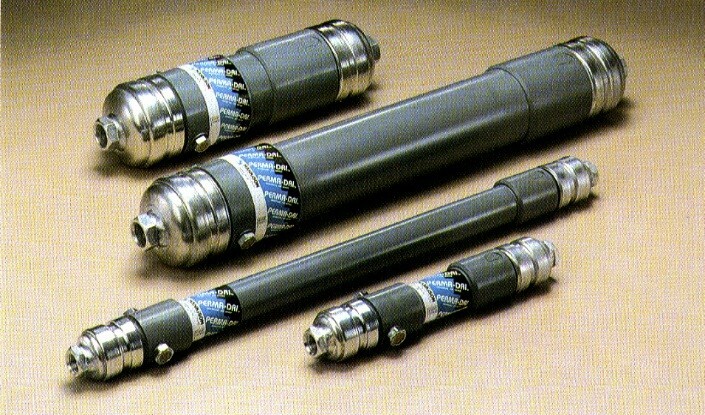 They can operate in severe environments, such as high or low temperatures or corrosive and explosive atmospheres.